JAMMU, Aug 30: The workers of Dogra Front & Shiv Sena under the leadership of their president, Ashok Gupta, held a protest in Jammu city demanding abrogation of Article 35 A. Wearing black clothes, the workers raised slogans in support of their demands. They said that Article 35A was not added to the Constitution by following the procedure prescribed for amendment of the Constitution of India under Article 368. Article 370 does not anywhere confer on the President legislative or executive powers so vast that he can amend the Constitution or perform the function of Parliament. It was brought about by the executive organ when actually the right of amendment of the Constitution lies with the legislative organ. 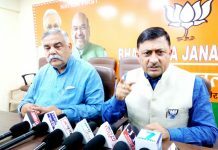 Stating that it violates the Article 14 for the equality of the law, Ashok Gupta said that Article 35A should be repealed for the betterment of the State.